Inflation expectations now exceed the Fed’s target. The 10-year US Treasury yield breached 2.5% on January 9 and hasn’t looked back since, closing on Friday at 2.55%. The three year yield closed at 2.12%, the highest since October 2008. The two year yield, after breaching 2% on Friday intraday, closed at 1.99%, the highest since September 2008. Bond prices fall when yields rise. And the selloff in three-year maturities and below shows that the short end of the bond market is reacting to the Fed’s rate-hike environment. The moves in the 10-year yield, however, defied the Fed in much of 2017, with the yield actually dropping. With long-term yields falling and short-term yields rising, the yield curve “flattened,” and there were fears that the yield curve would “invert,” with 10-year yields dropping below two-year yields – a scenario that has proven dreadful in the past, including just before the Financial Crisis. But recently, the 10-year yield too has begun to respond. Though the “new Fed” in 2018 hasn’t fully taken shape yet, with several key vacancies still to be filled, there is already tough talk even among the “doves.” And that’s where tough talk matters. On Thursday it was New York Fed President William Dudley who outlined the “two macroeconomic concerns” he is “worried about”: “The risk of economic overheating,” and that the markets are blowing off the Fed. In the end, the Fed “may have to press harder on the brakes,” he said. On Friday, it was Boston Fed President Eric Rosengren who told the Wall Street Journal that he expected “more than three” rate hikes this year to get this under control before it’s too late. “I don’t want to get to a situation where we have to tighten more quickly,” he said, citing specifically the “fairly ebullient financial markets,” and the risks of waiting too long. These “doves” are worried that the Fed will have to speed up its rate hikes to get a grip on asset price inflation, wage inflation, and consumer price inflation before they become difficult to control. Labor markets have become “tight.” Consumer prices as measured by annual CPI rose 2.1% in December. This means that Treasury securities with maturities of less than three years are still losing their purchasing power faster than they’re compensating investors for it with higher yields. This is considered very stimulative. In June, the trough of last year’s “low inflation” dip, CPI rose by 1.6%. Wall Street and its economists were clamoring for no more rate hikes. But Fed Chair Janet Yellen shrugged them off, saying that there were some special effects that caused this dip in inflation, but that it would be “transitory.” By early October, the underlying data showed that Yellen had been right. Even while Wall Street’s economists continued to clamor for a slow-down of the already glacially slow rate hikes, the Treasury bond market was starting to read the memo. And recently, its inflation expectations have spiked. Importantly, this expectation of 2.01% inflation now exceeds the Fed’s annual inflation target. How did this happen? In recent weeks, investors, increasingly worried about inflation, bought TIPS. Prices of TIPS rose and their yields fell. At the same time, these worried investors sold off their regular Treasuries. Prices fell and yields rose. This is a time-honored strategy by conservative investors when facing an environment of rising inflation. 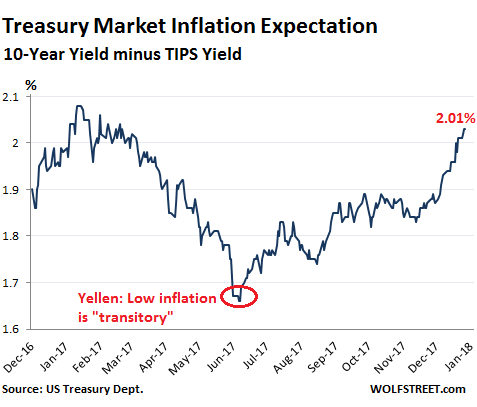 The widening difference between the yields of TIPS and Treasuries is how the bond market puts a number on its inflation expectation – a number that the Fed watches closely. Investors stand to lose a lot if inflation rises further over the next few years because today’s still low yields won’t compensate them for the loss of purchasing power. And they’re getting just a wee-bit nervous about it. For a total of $420 billion in 2018. This is scheduled to increase to $600 billion in 2019. The 10-year Treasury is the benchmark for consumer and business credit. As the 10-year yield rises, so will mortgage rates, interest costs on business debts, and the like. In short, borrowing over the longer term will get more expensive. Companies will back off from expansion projects and hiring, reducing pressure on wages, etc. This is what the Fed wants to accomplish. The 10-year Treasury yield is one of the transmission channels of the Fed’s monetary policy into the real economy, and it has been slow to kick in. But it is starting to. ← When Profits at Utilities are Privatized and Losses Socialized, Do We Still Need Public Shareholders? Don’t believe a word of it. The Ponzi collapses if rates rise significantly. The puny increase we have seen is transitory and the 10 year rate will sink again. Credit must remain super loose and the Fed must continue backdoor easing or the whole corrupt souffle collapses. Are you telling me the Fed doesn’t know the economy is 100% corrupt? RIDICULOUS. Grow up. By backdoor easing, I mean forcing our proxies, such as China, to buy assets, which China is doing. levers of power we have. Or was that a different person posting under the same name. Or are you being sarcastic in one of these posts and I’m too dense to see it? Or are you saying that the Fed can raise rates, but then market rates will not correspondingly follow (ie Fed can raise to 15%, but 2y UST’s will still be 2%)? The Fed can try, but the market rise is being hedged with Treasuries. Demand will keep forcing rates down no matter what is done. Low rates force speculation in the hunt for yield. So we have the curious case of the Dow rising while interest rates fall. The Ponzi wants all the money in the Ponzi, not just some of it. Also note this: by this stage of the Ponzi, increasing rates only makes Treasuries more attractive as a hedge. 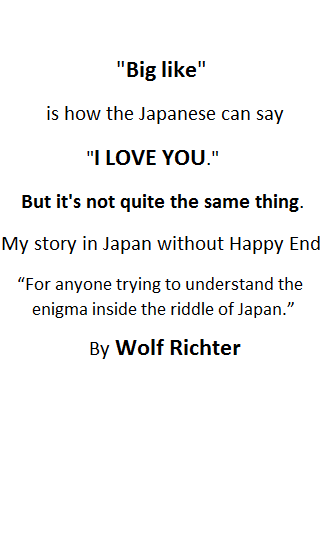 That is the only effect, it has no other implications. So we have another curious thing: raising rates only lifts the stock market. This shows you that central banks have no more relevance to finance. Anything they could do (for example, 15%) is perfectly priced in. In economics, this is called perfect knowledge. The Ponzi has perfect knowledge of central banks. Cope with it, fella. Not all the debt purchase or issuance will stop this process. The end will be a dollar funding shortage which cannot be cured. That is because 100% liquidity equals 0% liquidity. Everything will stop within a few days–but only after Dow 45K, maybe Dow 70K. That is, the dollar funding shortage must become universal. Until then, the Ponzi will continue to vacuum money out of the economy. Nothing can stop any of this from happening. Another day of some crusted remains of Volker projecting the future by reading the entails of the belly of the yield curve? Real rates are going to rise and never look back! Operation QE twist, ride the lightening ? Crushing interest rates, take 37500 days and counting! It’s Scylla and Charybdis. You really don’t want to be these guys at this juncture in history. They need dry powder so they can do it all over again when the next crash caused by them comes along. Who could’ve foreseen that the Fed’s debauchery of the currency would ever produce inflation? Yeah, some real hard inflation here. Lower than the 2000s, 1990s, 1980s, 1970s, and earlier. Ayup, that 2% will shorely kill us. A move from 1% to 2% with significant leverage can be quite painful. Based on your comment, me thinks you’re really Tim Geithner. It’s difficult to resist the temptation toward ad hominem attacks, simply based on the poster’s handle alone, but I’ll try to stick to the facts. CPI is a bogus “statistic” and doesn’t include real world stuff like houses, for example. Many other components are underreported by various slight-of-hand methods (e.g. “hedonic adjustments” and other BS stats.). This is a gov’t.-generated number. Do you think that there is no bias or conflict of interest here? In God we trust, but gov’t.? Asset inflation is still inflation; also not included in CPI. Check out inflation chart for rent, house prices, healthcare, college edu. PPI, CPI, ASSET, some inflates, some deflates, or flat. What matters to the cost of my life are CPI and RENT. RENT includes medical insurance, tuition and house rent, mortgage payments. Like all past civilizations, rent seekers will make sure the mass pay maximum they can have so they would NOT have any savings and they will be forced to work forever. In other words, RENT is about control. RENT is about freedom. CPI on the other hand, is what costs to stay alive and if CPI truly gets into trouble, that will threats survival and will invite social unrest. So the best policy from ruling class point of view is to keep CPI down while inflate RENT. ASSETs and PPI is about banks/business stay thriving , NOT about individuals. The point is, for individuals, one needs to emphasis rent and NOT CPI. For folks who do NOT need education and own houses, and have medicare, they out of the RENT seekers game. CPI is the only thing left. So every one has different circumstances. 2% inflation that is calculated by the A=Pert continuous compounding formula: A dollar will be worth less than fifty cents in ‘today’s money’ in 35 years. The Fed’s 2% mandate over 100 years: $1.00 = $0.134. But inflation has not been 2% since the creation of the Fed in 1913. In real value, a 1913 dollar is worth $0.04039 today. I make no judgement either way, but that’s the math. Throw in a risk-free RoR on top of that 1913 dollar and the picture is totally different (i.e. the dollar has actually held up very well). Dont you have that back to front today’s $ being worth . 04 of a 1913 dollar?? The Chinese and the saudi ‘s and the rest of the EM lightened up on treasuries this time last year and yields fell? Presently the Chinese and Japanese are passing them back and forth , any excess returns funnel to the Fed? The Banks need to clear the old mortgages off the Feds balance sheet and experience deflation or continue to fight around the globe and bring misery in a different form? Allowing the mortgages to mature in 2036? Inflation is what the Television has you believe and yet the Fed keeps any fresh capital reaching the system? What is likely to happen to gold in this environment? It’ll either go way up because people will be afraid of inflation. Or way down because no one will have any f’cking free money anymore. Or stay about the same because people won’t be able to figure out if it should go up or down. Better move fast, the future won’t wait!!! – you can take this advice to the bank mate..! QE due to failure of the P 44 and current administration, to cooperate with the FED has caused havoc in some areas of the Market . So logically the unwind, MUST do similar, to some sectors of the market. No matter how gently the FED goes about it. Can you do another update on the Fed balance sheet? They were supposed to allow 30 billion to roll off in Q4 2017, but it looks like only 10 billion was rolled off. It appears they aren’t sticking to the script. The NY Fed was mostly closed over the holidays, it seems, and nothing much happened, sort of as expected. So far, the Fed allowed $17.5 billion of Treasuries to roll off. MBS lag about 3 months (due to settlement issues) as I discussed in my last update. They’re now also showing lower lows and lower highs in their large weekly variances, with the current low being $3 billion lower than the Oct low (so roughly this would reflect October roll-off). I will do an update after the end of January. This should show whether or not they accelerated the pace as scheduled. That’s the next big thing. Quick question: you cite $400+ billion of QE related bond rolloff from the Fed’s balance sheet this year. We know they’re holding roughtly $4 trillion of bonds total. Does this imply a ten year plan to normalize their balance sheet? And what happens if the next recession begins before their B/S is normalized? So after October 2018 it is 50 billion a month. My guess is they hope to have enough bullets in the rate bag that they would just have to taper normalization in the case of a recession while reducing short term rates. To answer the first question, the goal is to accelerate to $50B per month ie 2018 Q4=$150B. It would stay there for a total of $600B per year until normalized. Second question if have no idea. They’re holding $2.46 trillion in Treasury securities and $1.76 billion in MBS. So a total of $4.2 trillion. They also have other stuff on their balance sheet that has nothing to do with QE, such as gold. Before the Financial Crisis, the balance sheet grew to $800 billion. It always grows, based on the size of the economy, so it won’t go back down to $800 million. If they allow $420 billion to roll off this year, $600 billion as planned in 2019, and $600 billion in 2020, they’re down to $2.6 trillion. If they allow this to go on in 2021, they’re down to $2.2 trillion. They have not officially said where they will stop, but some members have mentioned informally amounts in that range. So if allowed to move forward as planned, it will take 3-4 years. QE took 7 years. How many times in the last ten years has the economy seemed to improve only to sputter out? Every single time. After ten years of Fed failure, I highly doubt that this time will be any different. Oh it will be different. The economy will struggle, wages will lag, but the fed will erode the dollar. Stagflation will be a word we will hear a lot over the next decade. One good thing, if anything good can be said about stagflation, is that it may lead to moderation of the national debt. Not sure what a “moderation” would be. Seems like it’s kind of a large gray zone how much debt is too much versus not enough given the nature of how we all lend to the government in our current system. That’s ‘cos those ‘improvements’ were predicated not on production and export, but on credit creation and bubble-blowing. It’s funny how long it’s taking people in countries like the USA and the UK which have followed the neoliberal playbook and hollowed out their manufacturing base to understand why their place in the world is changing. Don’t seem to be willing/able to connect those dots. Weird world of delusion enabled by access to massive amounts of cheap credit. When I first heard the term “service economy”, I thought the people saying it were not serious. It is of no surprise that China and other countries are rising because they are making things that people want. The quality is improving as well. Ironically a an old PC game called SimCity 4, mimics the death spiral of economies that attempt to eliminate the manufacturing base. Players would attempt to eliminate the various elements of industry to make everything look cleaner and wondered why their cities were suffering a half a century later. Because people would make this mistake time and time again, the game was considered to have a difficult learning curb. Unfortunately in the real world, pollution doesn’t work like this, and the exportation of misery is real. To continue on the Sim City thread I suppose this is why their latest and greatest glassbox engined iteration wasn’t that fun to play and instead bankrupted the company/division. Because it actually integrated resource depletion and pollution into the city/state/region buildouts in such a (realistic) way that one couldn’t help but watch their cities choke and die by the end game; and for some reason players didn’t think it was that fun to watch something they’d spent tens of hours building up struggle to survive.. At least that’s what I heard – I never played it because I hate the company and all the reviews were mediocre at best..
Q2 and Q3 2014: real GDP growth of 4.6% and 5.2% respectively. And what did it mean? Nothing, because it was an aberration. But the CNBCs and WSJs of the world promptly declared “escape velocity”! Wolf (and the WSJ, and the Fed) have it EXACTLY backwards. It is these short bursts of above trend growth and inflation that are transitory, and not the other way around. – Yeah, sure. Rising interest rates is a sign of inflation. And I was born yesterday, right ? – If inflation is rising or about to go higher then I would like see to other indicators move in one particular direction as well. And those indicators don’t give any worrying signs (yet). – Rising interest rates are EXTREMELY DEFLATIONARY. Especially when wages remain flat or don’t go up too much. If wages would (dramatically) rise then I would start to worry. Not only are wages not rising much, but pensions are now starting to be cut. This includes pensions currently being paid and those to be paid in the future. This curtained income stream is very deflationary. The state of Florida has a two tiered system for future pensions, newer hires will get less when they retire. And at least one southern state forbids overtime to be included in calculating wages for retirement. Most states have introduced tiers in their pension systems based on entry date into the system. NY STRS for example is up to 6 tiers at this point. If you wait to see the “whites of inflation’s eyes” as Krugman puts it (and also as he recommends), then you’ve waited too long. Central baks are either out ahead of inflation or they spend a decade (1970s & early 80s) chasing it. I’d rather they be way out ahead of it, even if it does slow economic growth considerably (and it will). Inflation mostly comes from wage increase and that is happening. The consequence I worry about is creating dollars is inflationary. Look at the record, since 1971 especially. A new car in 1971 could be bought for $2500 and today it’s $25,000. Yes we are going into deflationary demographics due to little population growth and the Baby Boomers retiring, but our economy since Reagan has been built on credit creation, not wages and prices still increased. The credit card has made up for lost wages and kept prices going up. I really don’t believe the governments CPI data, it is much higher and that makes the GDP even lower. They’re incentive is to brainwash us as low as possible otherwise how would we ever allow the Fed ever get away with ZIRP. If the Fed, ECB, and BOJ all collude together to tighten like they did to increase credit, may the dollar may be OK for a while. But China, Russia, and Saudi Arabia are moving away from the dollar especially with oil market trading. If the Treasury cannot sell bonds, the yields will rise. I am wondering if the yields are rising because of the “sniff” of inflation or is it the lack of demand internationally to buy those bonds? Who needs treasuries if they do not need as many dollars anymore. I think we will see deflation especially with stocks and homes, but I think there will be a mixed bag of other prices depending on the value of the dollar. My auto insurance has doubled since 2009, and I do not see that going down unless nobody can afford to drive. But then we just may see more driving without insurance than there are now. If no one can afford to drive, the risk pools get messed up and insurance costs will skyrocket. Just look at the costs of insuring supercars – it can be 50% of the car’s cost /annually/!. On a related note, this is one of the open questions people have about ‘driverless cars’ (not that I think they will be ‘a thing’) – once they come out everyone will have to use them, because no one will be able to afford insurance on a normal car because of the small risk pool problem (along with questions about how liability will be assigned in a mixed car market). There is also a separate issue of insurance floats taking a hit when the market tanks. There’s definitely a lot that can go wrong in the insurance market for sure..
No it’s not, at least not in any relevant way. We’re still right around 2-3%, where we’ve been for years. Let me actually add to that. 2017 was, despite the overarching media narrative, a terrible year for labor. Total payrolls grew by about 2 million. The media celebrated that. It the worst year for payroll growth since 2010. To put it in perspective, during previous periods of stable/strong economic growth, 3.5-4 million would be considered a good number. Not even a great number, but decent. And we were at half of that. Posting the daily Fed balances, the roll off amounts and the QE balance sheets, and proposed targets might get you alot of eye-balls. Right now, it’s all vague and somewhat abstract. If you had a go to link on your site, it would save you from answering the same question over and over again. It seems the NY Fed, which handles all this, essentially shut down over the holidays and there wasn’t much activity (kind of expected). So it wasn’t worth doing a report. I will do the next one after the end of January. This should show an increase in roll-off as per schedule. One should always assume the Fed will remain behind the curve, so what are they doing here? 1/100% above the 2% target? The TIP bond ETF is not walking the walk, but that investment performs better in periods when yields are low, not when rates are rising. TIPs have never performed the way you might expect. There is a lot of kindling in terms of unused credit that exists. The Fed needs to get rid of this kindling before it all catches fire; hence the rapid and accelerating shrinkage of their holdings combined with rate increases. The longer I see what has been going on in the markets, the more I think the Fed should vastly more fear deflation. Because when rates go up, asset prices should deflate. Because when taxes go up, asset prices should deflate. And given the need to remove all of that asset support, the Feds have started to cut asset price support, and taxes demographically will have to rise to support the level of entitlements, or we kill the Defense Department off to the level of 1934. Hard rain is coming, because everyone keeps babbling about the 1970s- and showing our age. Demographics alone tend toward massive deflation, and the massive export of dollars into the world economy has left the domestic economy entirely dependent on credit expansions…..and without real wage growth they are illusions of wealth that evaporate with the payback curve. Simply put, the medical establishment is about to go bust, and when that growth curve breaks, it takes the rest of the US economy with it. 74 million boomers are entering socialist medical care- 3 million plus per year turn 65 (4 million in 1956+65= 2021!!!) and that burden requires a more efficient system to provide basic healthcare. And the politicians continue to play in the Sandbox- going to be very interesting decades coming up. or the other way when asset prices deflate then rates will come down. a small increase in interest rates has a big effect on the price of oil, where over supply is funded by ridiculously cheap high yield bonds. the Fed raises a teeny bit, gets a big dose of energy deflation and the rest of the asset price complex goes down the vortex. raising interest rates RAISES inflation kills the recovery (lost jobs in energy and the export market). I just hope my new Medicare doctor speaks English. Cheap money caused a reckless search for yield, and to get any kind of yield at all, investors had to take huge risks. And there was so much money looking for a place to go… and much of it went into shale oil and gas and funded the huge drilling boom, and the ensuing glut that crushed prices. When yields go up, investors have to take less risks to get the same returns, and they go for that. Funding in the shale patch will get more difficult and expensive and for riskier producers will dry up. Since shale drilling has been cash-flow negative for years, it is not a self-sustaining activity. Once new money gets scarcer and more expensive, drilling slows down, the oversupply goes away, and prices surge. This theory says that cheap money caused the collapse of commodity prices that then filtered into “low” inflation. More expensive money will reverse that, the theory says, and boost inflation. The Fed then has two ways to go, after raising interest rates and energy prices, the economy shuts down. Labor at full capacity. Good jobs and investment is lost in the energy industry. Very little room above lots below. Energy exports end, the Fed has to keep rates higher to attract bond buyers, and protect the dollar, or they can go back on the rate hikes. Negative economic effects overwhelm higher prices for energy, and a deflationary vortex is created. They messed up in 2007, and they are doing it again. paper assets. Does the opposite hold true ? I guess labor has become just another commodity. I wonder how real estate would react to the new inflationary environment, will the prices decline as a result of higher interest rates or increase as more people go into real estate as an inflationary hedge? It has been estimated that the government deficit will approximate 1 trillion in 2018. The FED is not selling bonds it is simply allowing them to mature and exchanging them for cash from treasury. So your numbers are out by 30 % +. Your question should be who will buy the .5 T that the FED dosent. As the treasury auctions are currently still 200% oversubscribed I d9oont envisage any LBJ/Nixon era problems, for some time. I look forward to higher rates. CB rates below 3 % are part of the problem, not solution. As long as they are mated with bank general deposit rates over 4%. Which gives 6 to 7 % long term Mortgage rates, or used to. when I worked in Banking. But that was in a country where systemic fraudulent banking behaviors, completely legal in the US, were, and still are, highly illegal. The way to solve this is to have tons of Preparation H rain down on the FED, both the directors and the balance sheet and simply shrink everything. The Fed can’t possibly believe the economy is overheating. The economy has been in a deep depression for years. They are just interested in keeping the stock markets up and interest rates down. They know all the statistics are false.